Dermatologists and stylists agree that most of us don’t need to wash our hair every day. In fact, shampoo-skippers have found that going an extra day or two between shampoos can result in shinier, less frizzy hair. But despite the expert recommendations and potential rewards, it can be hard to get past the feeling that your hair might look oily or unclean if you don’t lather up. To eliminate that feeling, Chelsey Sanderson at Ambiance (which produces dry shampoo for the leading brands) led the charge to create a tinted, all-natural dry shampoo for consumers. For those mornings when you want to give your locks a break, or you’re too rushed to wash your hair, Ambiance will absorb excess oil and give your tresses a volume boost. It lifts hair at the roots to add body and helps keeps your hair manageable between shampoos. Ambiance also doubles as a concealer to minimize the appearance of gray roots and thinning hair. It comes in different shades to blend with your hair color (and avoid the cloudy tinge that white powdery options can leave). Plus, it’s all-natural and contains no alcohol so it won’t damage your hair even with frequent use. When there’s no time for a morning shampoo, or if your tresses need a refresh at the end of a long day, it’s Ambiance dry shampoo to the rescue. No water required. Hello everyone! My name is Chelsey, and I am so happy to have Ambiance Volumizing Dry Shampoo & Concealer featured on The Grommet today. Ambiance Volumizing Dry Shampoo & Concealer is a color tinted powder that comes in five different shades: Brunette, Blonde, Black, Red and Gray. Ambiance is the perfect and instant solution when you need to clean and refresh your hair, cover roots between hair colorings, and conceal areas of the scalp where hair is thinning. It is safe and gentle enough to be used every day, and fits easily into purses and gym bags for touch ups wherever you go! I look forward to the questions! How is this item applied to the hair? It is applied by tapping the brush directly onto the scalp. Wanted to thank you for not leaving out us grey haired gals! Drying is a real consideration for many of us. Can't wait to try this new product, and I'm so happy that it is natural. Thank you so much for taking the time to write! Because dying your hair is so damaging, many people do not want the added chemicals on their scalp and in their hair. Gray hair is beautiful and Ambiance is a perfect way to freshen up your hair and give volume without having to wash and dry your hair daily! This would be awesome for camping trips, travel in general and days spent sailing, as well as those mornings when there just isn't time for a shower and evenings when going straight from work to a night out on the town. What a cool product! I even use it after i finish working out, it is a great way to absorb the sweat so that you don't look like you just left the gym! I have medium auburn color over grey hair. To cover my roots, would you suggest brunette or red? It depends if your hair color has more of a red hue or a brunette hue. I have women whom use both. I have light brown hair. What color would you recommend? Blonde or Brunette? With the summer coming up, if your hair lightens with the sun, I would suggest the blonde. I was wondering if the powder falls out of your hair throughout the day making it look like you have colored dandruff on your shoulders. No, as long as you do not over apply (which would be hard to do…you would have to put a lot on), the product will fully absorb without falling onto your shoulders. Also, once you run the brush though your hair a couple of times after applying, it will remove any loose powder. I have never experienced the problem myself, and have never had a customer tell me they have experienced it either. 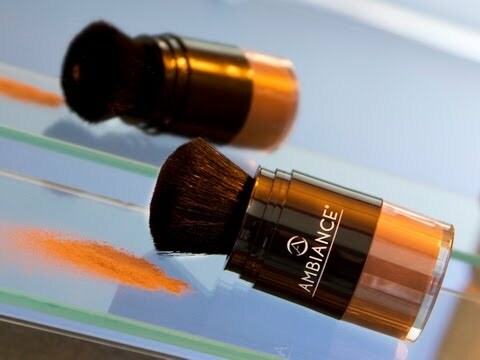 Ambiance is a temporary color tinted powder, so you should treat it the same way as you do any temporary makeup product like lipstick, foundation, or face powder. I have recently stopped coloring my hair dark brown. I have about 1/2" of silver showing at this point. Will this product help disguise my "skunk stripe"? More importantly, if I use the dk. brown product on a regular basis, will it discolor the silver? Ambiance dry shampoo will help cover your roots until the next time you wash your hair. Because it is a temporary product, it will not discolor your hair. How many applications are possible? With average use, the 14g brush lasts thirty days. When refilling, can two colors be combined, e.g.brown and red, or does the refill become totally inserted into the brush? The refill has 1oz of product, which would fill the brush twice. You would unscrew the base of the brush to fill product as needed. If you wanted to combine colors, you may do so, but it may get a little messy! Thank you for your comment. First and foremost, we respect your opinion, and encourage everyone to use only products that they feel are safe, and that includes our product. That being said, we feel our product is completely safe, and have listed the following information for anyone, and everyone, to research for themselves and determine if it is a Ambiance Dry Shampoo is a product they feel safe using. The ingredient referenced in your comment, Aluminum Starch Octenylsuccinate, is approved by the FDA, and is deemed safe for use food. When used in foods, Aluminum Starch Octenylsuccinate is identified as a modified food starch. It is also approved for use in cosmetics. Although it is approved for use of concentrations as high as 30% in cosmetics, our formula has less than .001%. We feel the information listed below will help all consumers make an educated choice. Thank you again. Int J Toxicol. 2002;21 Suppl 1:1-7. Final report on the safety assessment of aluminum starch octenylsuccinate. Nair B, Yamarik TA; Cosmetic Ingredient Review Expert panel. Aluminum Starch Octenylsuccinate is the aluminum salt of the reaction product of octenylsuccinic anhydride with starch. It is used in cosmetics at concentrations as high as 30% as an anticaking agent and a nonaqueous viscosity increasing agent. No information was available on the presence of impurities in the cosmetic-grade ingredient. When used in foods, Aluminum Starch Octenylsuccinate is identified as a modified food starch, and is subject to limitations on heavy metal residues. Oral studies using Aluminum Starch Octenylsuccinate or its related sodium salt produced no adverse systemic, reproductive, or developmental effects. Dermal injections produced no abnormal skin or systemic reactions in guinea pigs. Ocular toxicity was assessed in rabbits and using an in vitro test (chorioallantoic membrane vascular assay). In both cases no toxicity was seen. An acute inhalation toxicity study in rats was negative. Clinical tests indicated little irritation potential and no sensitization. Absent data on impurities in cosmetic-grade material, it was determined that such material should meet the same impurities requirements established for modified food starches. Based on these available data the Cosmetic Ingredient Review Expert Panel concluded that Aluminum Starch Octenylsuccinate is safe as used in cosmetic formulations provided that established limitations imposed on heavy metal concentrations are not exceeded. The following toggler user interface control may not be accessible. Tab to the next button to revert the control to an accessible version. Cell biology of aluminum toxicity and tolerance in higher plants. Research Institute for Bioresources, Okayama University, Japan. Aluminum is the major element in the soil and exists as a stable complex with oxygen and silicate in neutral and weakly acidic soil. When the soil pH is lower than 4.5-5.0, Al is solubilized in the soil water and absorbed by plant roots. Absorbed Al inhibits root elongation severely, and the elongation of roots exposed to Al3+ as low as mumol level is inhibited within an hour(s). Thus much research has been conducted to understand the mechanism of Al toxicity and tolerance. Al is located specifically at the root apex. Al-sensitive plants absorb more Al than do Al-tolerant plants, and thus the exclusion mechanism of Al is the major idea for Al tolerance. The understanding of Al stress in plants is important for stable food production in future. Al is a complicated ion in its chemical form and biological function. In this chapter, mechanisms of Al toxicity and tolerance proposed during the past few decades as well as future topics are described from physiological and molecular points of view. 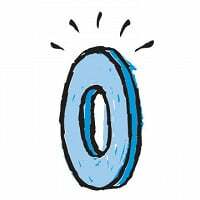 This article is about the metallic element. For other uses, see Aluminium (disambiguation). Aluminium (or aluminum) is a chemical element in the boron group with symbol Al and atomic number 13. It is silvery white, and it is not soluble in water under normal circumstances. Aluminium is the third most abundant element (after oxygen and silicon), and the most abundant metal, in the Earth's crust. It makes up about 8% by weight of the Earth's solid surface. Aluminium metal is so chemically reactive that native specimens are rare and limited to extreme reducing environments. Instead, it is found combined in over 270 different minerals. The chief ore of aluminium is bauxite. Aluminium is remarkable for the metal's low density and for its ability to resist corrosion due to the phenomenon of passivation. Structural components made from aluminium and its alloys are vital to the aerospace industry and are important in other areas of transportation and structural materials. The most useful compounds of aluminium, at least on a weight basis, are the oxides and sulfates. Despite its prevalence in the environment, aluminium salts are not known to be used by any form of life. In keeping with its pervasiveness, aluminium is well tolerated by plants and animals. Owing to their prevalence, potential beneficial (or otherwise) biological roles of aluminium compounds are of continuing interest. Aluminum chlorohydrate is a simple form of aluminum-based salts that is used to provide wetness protection in underarm antiperspirant products. Aluminum chlorohydrate is also widely used in water purification to remove dissolved organic material. Aluminum chlorohydrate is typically mined and purified from the naturally occurring mineral bauxite. Aluminum is the third most abundant element in the Earth's crust behind oxygen and silicon. As previously noted, the primary source for aluminum is from the bauxite ore. In this product, we are using an aluminum chlorohydrate prepared from recycled aluminum (recycled in the USA), which was originally from bauxite ore. Aluminum, like many of earth’s resources, is finite. Using recycled aluminum reduces energy consumption and greenhouse gas production as compared with sourcing aluminum from bauxite ore and helps to manage depletion of a global finite resource. Aluminum chlorohydrate is one of the 18 wetness protection ingredients approved by the Food and Drug Association for use in over the counter underarm antiperspirant products. Our clinical studies show that people who use our antiperspirant stick have significantly dryer underarms. than those not using and antiperspirant. While the aluminum chlorohydrate reduces the amount of sweat on the skin surface, the ingredient also creates a skin environment which is hostile to the growth of malodor-producing bacteria to help reduce underarm odor as well. Aluminum-based salts are currently the only ingredients recognized by the US Food and Drug Administration helps prevent underarm wetness. The FDA recognizes a number of forms of aluminum-based salts including aluminum chloride, aluminum chlorohydrate(s), and aluminum zirconium salts. Consumers who do not wish to use an antiperspirant product may be interested to know that Tom’s of Maine also produces a line of deodorant sticks and roll-ons, which include a number of aluminum free deodorant options. We feel it is important to offer individuals a choice and trust that they will establish a personal care regimen that is right for them. We are aware that many people are concerned with the safety of aluminum-based underarm products as a small number of studies have linked the use of such products with the occurrence of breast cancer and Alzheimer’s disease. Based on a thorough review of all the literature available, and the recommendations of the American Cancer Society and the Alzheimer’s Association, we believe that the use of our product is absolutely safe. As recommended by the FDA, you should consult with your doctor about the use of antiperspirant if you suffer from kidney disease. Since the kidneys play an important role in eliminating aluminum from the body, the FDA decided it was prudent to alert consumers who have kidney disease to the fact that their exposure to aluminum from use of antiperspirants might need to be discussed with their physician in order to make sure that the aluminum will not accumulate in the body. As with any OTC product, antiperspirants should be kept away from children. Tom’s of Maine recognizes that no two people are alike, and even with pure and natural ingredients, some individuals may develop an allergic reaction that is unique to them. As with any product, be sure to discontinue use if you experience discomfort or other indications that the product may not be appropriate for your individual body chemistry. Several questions from a sulfate/silicone shunning curly hair person. My hair is extremely thin. I typically conditioner wash -- no traditional shampoo-- and diffuse without touching. No toweling, ever; no brushing, ever. Would your product work without any touching afterward? Can you compare it to the natural hair fiber products in terms of coverage, and in terms of how it affects shine? Thanks in advance. You do not need to use a brush or towel after applying. Some people use their fingers, some don’t, but it not necessary if you use the application brush correctly. As far the coverage is concerned, we feel our product works as well, if not better, than the hair fiber products on the market. In larger part, because you have to use an adhesive spray with the fibers, and with Ambiance, you do not. As far as the shine is concerned, you should see much better results with Ambiance as we do not use alcohol in our product, like the fiber adhesives do. Hope that helps! i read reviews of this product on other sites that say that it dispenses too quickly and/or unevenly, and that if you touch your head, it leaves your fingers stained (even hours after application). I would like to try it, but am concerned about these issues. Any review that states our products stains your hands is absolutely not true. In is important to know that Ambiance is a temporary makeup for your hair, and just as with lipstick, mascara, or foundation, you want to avoid contact with your makeup. If you do get powder on your hands, simply wash your hands with soap and water, just as you would with any makeup. These instruction are clearly listed on our labeling. As far as the product dispensing too quickly, we clearly state in the instructions how to use the brush applicator properly. Unfortunately, some people choose not to read the instructions. The Daily Grommet video clearly shows how to use the brush…it really is very simple! I don't color my hair, which is mousy brown with increasingly large gray streaks in it. What color would you recommend? I don't really want to cover the gray. If your hair is brown and has grey streaks, the shade of color you use depends on what color of your hair you want to accent more…or conceal. Please remember Ambiance is applied to your scalp, and not the length of your hair. Please let me know when this product is available in the blonde color as the options for selection are only black and grey. Dermatologists and stylists agree that most of us don’t need to wash our hair every day. In fact, shampoo-skippers have found that going an extra day or two between shampoos can result in shinier, less frizzy hair. But despite the expert recommendations and potential rewards, it can be hard to get past the feeling that your hair might look oily or unclean if you don’t lather up. To eliminate that feeling, Chelsey Sanderson at Ambiance (which produces dry shampoo for the leading brands) led the charge to create a tinted, all-natural dry shampoo for consumers. For those mornings when you want to give your locks a break, or you’re too rushed to wash your hair, Ambiance will absorb excess oil and give your tresses a volume boost. It lifts hair at the roots to add body and helps keeps your hair manageable between shampoos. 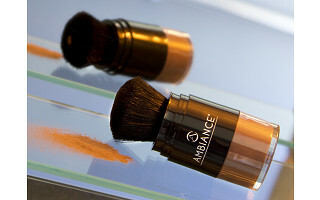 Ambiance also doubles as a concealer to minimize the appearance of gray roots and thinning hair. It comes in different shades to blend with your hair color (and avoid the cloudy tinge that white powdery options can leave). Plus, it’s all-natural and contains no alcohol so it won’t damage your hair even with frequent use.